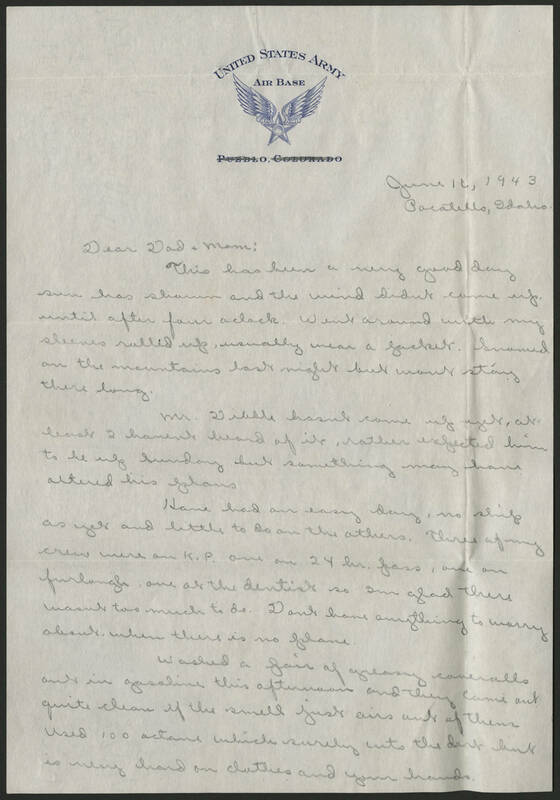 June 16, 1943 Pocatello, Idaho Dear Dad + Mom: This has been a very good day sun has shown and the wind didnt come up until after four oclock. Went around with my sleeves rolled up, usually wear a jacket. Snowed on the mountains last night but wont stay there long. Mr. Dibble hasnt come up yet, at least I haven't heard of it, rather expected him to be up Sunday but something may have altered his plans. Have had an easy day, no ship as yet and little to do on the others. Three of my crew were on K.P. one on 24 hour pass, one on furlough, one at the dentist so Im glad there wasnt too much to do. Dont have anything to worry about when there is no plane. Washed a pair of greasy coveralls out in gasoline this afternoon and they came out quite clean if they smell just airs out of them used 100 octane which surely cuts the dirt but is very hard on clothes and your hands.